Triple layers of fun wrapped up in this cheetah bow. Hot pink layered with lime green and topped off with a black and brown cheetah print. There is 120 inches of ribbon on this bow! 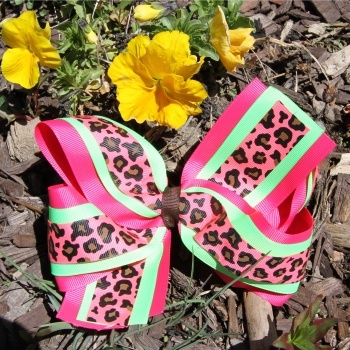 Have plenty of fun sporting off this wild print bow to match with all of your favorite cheetah outfits. The hot pink is a 2.25" grosgrain, the lime green is a 1.5" and the cheetah is a 7/8" grosgrain.